Can you do an LS1 brake swap on a 9-bolt rear? Brakes Looking to upgrade or get the most out of what you have stock? All brake discussions go here! I've done a lot of searching, but haven't found a direct answer on this. I realize that the ls1 rear disk setup is easy to bolt onto a 10-bolt rear, but what does it take to install it on a 9-bolt rear axle? Does one of Ebmiller's or anyone else's adapter plates work for it, or is the backing plate too integrated into the LS1 rear brake design to easily swap it for an aftermarket piece? 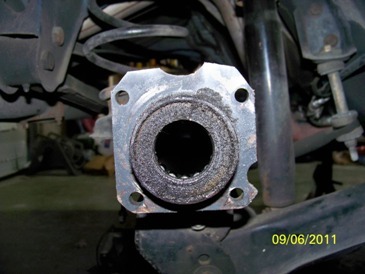 What if the LS1 setup were rotated slightly and new holes were drilled to match the 9-bolt axle flange pattern? Any knowledgable answers would be very appreciated! Re: Can you do an LS1 brake swap on a 9-bolt rear? Since the 9- and 10-bolt have different patterns, as you mention, something has to be redrilled--how safe that might be I'm uncertain. While I wouldn't attempt it, I do know that some members redrilled the backing plates to accommodate PBR's. Last edited by JamesC; 08-16-2011 at 09:02 PM. If you swap the backing plates side to side you have blank surfaces to work with for the re-drilling and you dont have to worry about anything cracking or breaking. I had bought a set of 10 bolt Baer backing plates from a member here years ago. I overlayed the 9 bolt backing plate on the opposite 10 bolt backing plate and there were no hole overlaps. I would say it can be done but it's not the easiest way to go. I'm thinking about installing a set of LS1's on my 92 that has a set of iron Delco-moraine brakes off of an 88 9 bolt. On that build we slotted the old backing plates to make them work on the 10 bolt drum rear end . If I use the old rear end I will have to slot the LS1 backing plates to get them to work. A easier way would to use the PBR style brakes for your 9 bolt. I seem to recall hearing of people swapping the backing plates to the other side, which allows a complete new pattern to be drilled. I wouldn't slot them: the act of using the brakes tries to spin the plate around the axle. 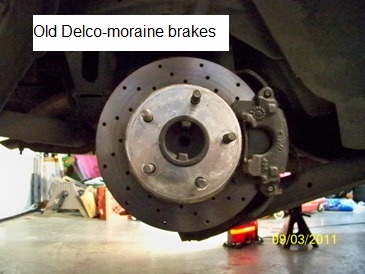 (duh) They're not just a "bracket" for holding the caliper, they are a LIVE part of the application of braking force. Not something that seems like a good idea to half-a$$. I have slotted many backing plates. The plate to housing uses bolt torque to keep the plates from moving. As long as you have one non slotted hole your more than fine. The factory bolts are not pressed in the housing or interference fit on the backing plate sooo they do move until the bolts are tightened properly. Slot away and use a grade 8 washer over the slotted holes. The plate to housing uses bolt torque to keep the plates from moving. None of this is correct, The backing plates are held by the shear force (May not be correct in that term) to prevent the plate from spinning, stretch has nothing to do with holding the plate from spinning. The LS1 backing plates can not be moved side to side they are marked left and right. If you tried to move them side to side the parking brake wouldn't work. Guess I should have 40-50 cars with messed up brakes then, some even road race!! Would I rather have the correct backing plate? Yes. Sloting works and is safe if done properly. I just finished this swap myself. I kept the plates on their labeled sides. I had to grind the axle flange on 3 corners to make them round and clear the backing plate. I then clamped on the backing plate, aligning so the caliper would be in correct position. Then drilled through the flange using the backing plate as a guide. I then removed the backing plates and ground the 3 ribs on the outer face down so the plate that retains the axle, bearings, and seal will sit flush. 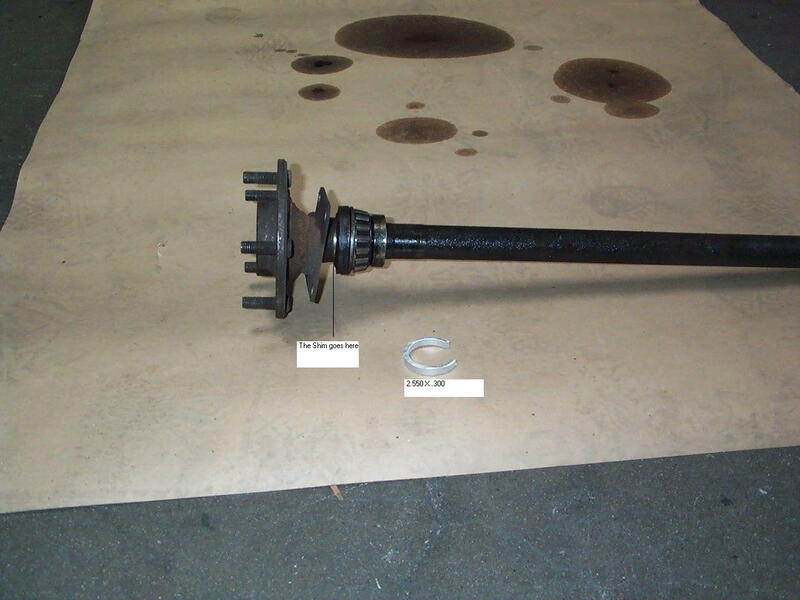 Then I removed the bearings, seals and plates from the axle. I then clamped the retaining plate to the back plate, making sure it was centered properly, and drilled holes to match. This left me with one good hole, and 3 slotted holes. To get rid of the slots I clamped the back plates on and inserted brass rods through the holes. I used a mig welder to fill in the slots around the brass, because the brass won't weld I then was able to tap the brass rods out, leaving clean holes behind. I had to grind a little bit on the back of the flanges to make them smooth after welding. Spacers then had to be made to make up for the increased thickness of the backing plates. I beleive the gap was about .300. I had some large shims left over from doing a gear install that I carefully ground to fit inside and maintain the pressure on the seal to keep everything retained. After that I just put the retaining plates on the axles, then the spacers, seals, and bearings. After placing the backing plates on the end of the axle tube I inserted the axles all the way and bolted them in. Bolted the calipers on and hooked up the lines. Took maybe 6 hours of my time to do both sides. Would have been faster if I had known what to do and my crappy harbor freight angle grinder works for about 15 seconds before it overheats. On every topic about this I see talks of shimming, but nothing is mentioned what is being shimmed. Is the rotor being shimmed out, like a wheel spacer, or is the caliper being spaced? That thread isn't about LS1 brakes. The shims appear to go between the backing plate and the flange. "Road racing", a relatively short-term, controlled application, is NOT THE SAME as putting brakes on the street. In "road racing", people sign away their life insurance, the "road" is closed to all but the "participants", and those assume all inherent risk in what might happen from stressing a car to the absolute max, for some defined, rules-limited, finite period of time, that ALL the other people around them are ALSO willing to sign away on. Their OWN car, and the cars they're "racing" against. Think NASCAR going around Martinsville... yeah, it's HELL on brakes, but they only have to last 1000 times of pushing that pedal. If you build in a safety factor, let's say you build your brakes to go 1100 times... the guy that sets his up to go 1075 times KICKS YER A$$; unless of course, the total # of qualifying and practice and overtime laps, leads to 1080 brake applications, in which case, their driver hits the wall. Is THAT the world you want to live in, DAILY? All the time? Going to the store to pick up a 6-pack or a steak or some diapers or laundry detergent? REALLY?? The street is not like that. You put yer wife, husband, whatever ya got; yer sons & daughters in yer own car; EVERY OTHER PERSON on the roads around you; at risk. For potentially HUNDREDS OF THOUSANDS of applications of those brakes. MILLIONS maybe. It's kinda like rocker arms... I can't tell you how many people have come to me with their street cars and wanted the aluminum rockers that "all the fast cars" are running at the track, while they drive theirs to school / work / GF house / grocery store EVERY DAY, and wonder why they shouldn't use the same stuff. Well... let's say you're running a drag car, and it runs 7000 RPM down the track, start to finish, and it takes 10 seconds. DAMN fast car... seems like every part in it must be "heavy duty", no? OK, HOW MANY TIMES does that rocker operate during a run? 7000 RPM for 10 seconds = 7000 / 60 *10 revolutions, which is around 1170 rotations of the crank, which in turn is, not quite 600 operations of the rockers. 600. In the whole run. Let that sink in. Let's say you do a burnout beforehand, and it goes to 5000 RPM for 5 seconds... OK, another 220 or so... plus idling around the pits and shutdown lane and the reverse demonstration check... How many times do YOUR rockers operate on the way to the grocery store? Taking your daughter or your son to school? Commuting 20 miles to work? … Now put that same kind of calculation to work on your brakes. Are you ready to sign away your right to collect on your life insurance, OR THEIR LIFE, because you want to half-a$$ a bolt pattern? THAT'S what's wrong with comparing "racing" conditions to "real life". Brakes are the ultimate "stay alive" part. I'm not real fond of my life, to the degree some people are; I have many disappointments, much sorrow, lots of compulsion to just give it up; but I'm not there yet. I want to stay alive. More than that by far is, I want to keep the OTHER people who are important to me alive, when they're in my car. Don't [alternate minority ethnicity] rig [/alternate minority ethnicity] your brakes. Do it RIGHT. 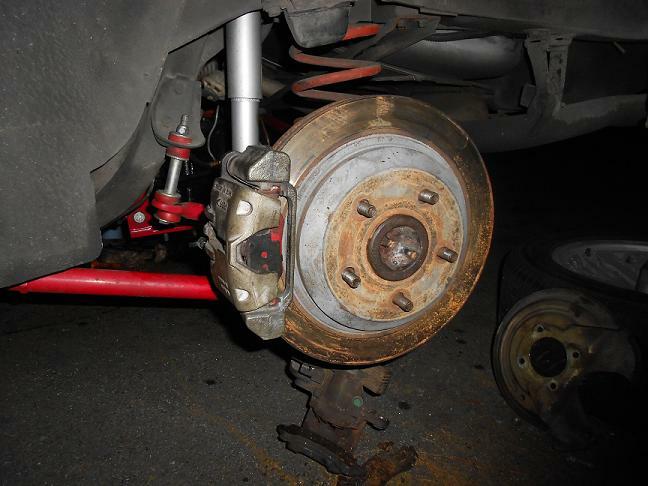 There are LOTS of ways for that; the simplest involve, taking some DOT approved STOCK brakes off of some car that has better brakes than yours, and PROPERLY putting them on yours. But in the long run, the method of putting them on your car, is EVERY BIT AS important as, which kind of brakes they are... if not more so. 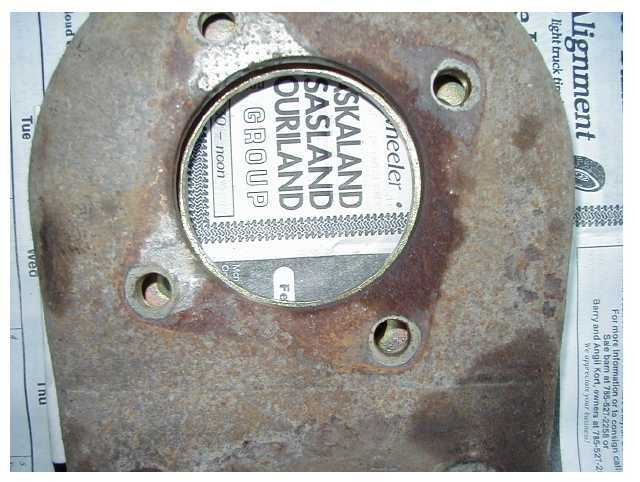 Slotting the backing plate holes and relying on bolt torque doesn't pass that test. For "road racing", maybe; but would I do that to my children? In the car I drive them to grade school in every morning? NO EFFFFFFING WAY. 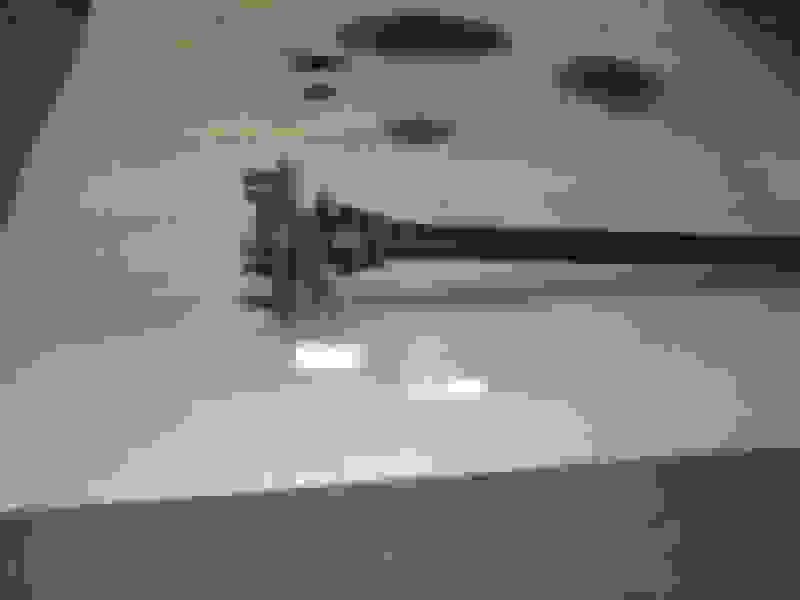 Last edited by sofakingdom; 01-24-2019 at 06:47 AM. C5/C6 brakes, front and rear, although these threads are rear-specific, are adaptable to several different brake configurations, and this new C5/C6 Rear Brake Upgrade from BBU affords 3rdgens that same versatility and adaptability. It's compatible with: 12", 13" and 13.4" rotors; LS, C5, C6 Z51(HD), C6 Z06 and Wilwood calipers; there's an optional parking brake; and there are multiple mounting options. All things considered, eight different rear brake configurations fit this new rear brake upgrade. Just in case it isn't common knowledge, 4thgen-LS, C5 and C6 HD PBR calipers are physically interchangeable. Each generation got progressively better and stronger, so C6 HD calipers are best and recommended, but each type will fit and work with C5/C6 12" and 13" Z51 upgrades. So if you already have LS rear calipers, then you can use them for this new upgrade, with pad abutment brackets for the corresponding rotors. Want Wilwood 4-piston calipers? There are two different ones that work with respect to each size, 12" and 13" Z51. How about C6 Z06 PBR 4-piston calipers? Yup, those, too, with Z06 13.4" rear rotors. As an example of this new upgrade's versatility, say you got new 18" wheels, and now you want to upgrade to 13" Z51, 13" Z51/Wilwood, or 13.4" Z06 brakes. With this rear upgrade, you'd get the specific rotors, corresponding pad abutment brackets(Z06 calipers don't use them), and appropriate calipers(LS/C5/C6 HD/Wilwood for Z51; Z06 for Z06). Then down-the-road, you decide to reinstall your 16" factory wheels, maybe just for a one-time special event. With this new upgrade, you wouldn't have to pull the axles and backing plates and reinstall your old backing plates and brakes. You'd simply swap to rotors and pad abutment brackets for 12" C5/C6 base brakes, use LS/C5/C6 HD calipers, and you're all set for your 16" wheels again. Then when it's over, and you're ready to go back to the future, you'd simply unbolt the smaller parts and reinstall your 13" parts again. It's that simple. Once you pull the axles and backing plates to install this upgrade kit, then you will never need to pull them again to upsize, downsize or change calipers/types. And, again, C5/C6 front brake upgrades are just as versatile. So with both upgrades, you will be able to have appropriately matching/performing front AND rear brakes/calipers: LS front and rear; C5/C6 HD front and rear; Z06 front and rear; Wilwood front and rear. No more mismatched calipers. 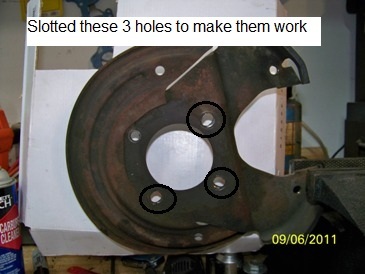 So stop expending your energy, time and money(yes, your time has a monetary value), possibly risking safety, trying to "create" ways to make 4thgen-LS rear brakes fit your 9-bolts. Get bigger and better with this versatile new C5/C6 Rear Brake Upgrade from BBU, and your brakes can be whatever you want them to be, anytime, now, and in the future. Last edited by LAFireboyd; 03-10-2019 at 03:56 PM. https://www.thirdgen.org/forums/brak...e-upgrade.html -- may be a better option than the ls rear brakes on the 9 bolt. Quick Reply: Can you do an LS1 brake swap on a 9-bolt rear?